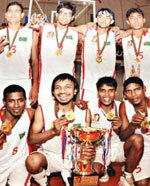 Bangladesh won the title of the 2nd SABA Basketball Championship held at Dhanmondi Basketball Gymnasium at Dhaka, Bangladesh. 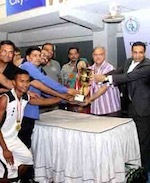 The 2nd South Asian Basketball Association (SABA) Basketball Championship for Men was held from 17 January to 21 January 2013 at Bangladeshi capitol, Dhaka. Top three teams of South Asia, India, Afghanistan and Srilanka did not participate in the championship. Five countries naming hosts Bangladesh, Pakistan, Nepal, Bhutan and Maldives participated in the championship. The championship was played in the league format with all the participating teams playing with each other and the team that accumulates highest points will be crowned champions. Bangladesh won all the matches in the championship to win the title while Pakistan were second (3 Win / 1 Loss) as Nepal was placed third with 2 win and 2 loss. Maldives was placed fourth with 1 win and 3 loss while Bhutan lost all their matches. Bhutan was named as the best disciplined team of the championship. Bangladesh coach Wasif Alis efficient strategy also aided Bangladesh s cause. I always asked the players to be cool and felt the boys a little bit tired, so I asked them to sue the height and conserve the energy, over all its a team effort and credit goes the players said Wasif. Mithun Sarker said they waited for the moment. After beating Pakistan we secured the title, it was the best match of meet, we were never worried about Maldives but it was a hard game as Maldives came out tougher than our anticipation said Mithun. However, Mithun Biswas was adjudged as the most valuable player of the meet for his overall performance. Mohammed Zilal of Maldives took the away the best player crest. Sheih Saud bin Ali al Thani, the FIBA-Asia president distributed he prizes as the chief guest. FIBA-Asia secretary general Hagop Khajirian, president of SABA Ajit Kuruppu, and Citycell head of corporate communications and public relations Taslim Ahmed were also present among others. The South Asian Basketball Association (SABA), a body of eight South Asian countries, organized the second version of the meet after the maiden tournament held in the Indian state of Assam in 2002. Then, hosts India drubbed Bangladesh 139:34 to win the title. A friendly Basketball match between Bangladesh Air Force (BAF) and Indian Air Force (IAF) held at the basketball ground of Bangladesh Air Force Base Bangabandhu on Thursday. Air Officer Commanding of BAF Base Bangabandhu Air Commodore M Mafidur Rahman witnessed the final match as Chief Guest and later, distributed prizes among the winners. In the competition, Indian Air Force basketball team clinched the title while BAF basketball team became runner-up. They defeated BAF team by 69-51 points in the match. Indian Air Force Basketball Team came to visit Bangladesh on November 22. Senior Officers of BAF, Airmen and other members of Bangladesh Air Force were present on the occasion.